Okay, Readers Mine, the day has gone well, the workload has been reduced, and I even had a chance to see an interesting lecture on James Hunnicutt to boot! Now it's time for my usual Monday ramblings about all things Breaking Bad. Well, the Emmys are come and gone, and if you're like me, you didn't watch them, preferring instead to be surprised this morning on teh intrawebs. And it was a surprise. Despite the considerable pre-show hype about the contest being between AMC's Breaking Bad and Mad Men, the night's big winner turned out to be Showtime's original series Homeland, which took the awards for Outstanding Drama, Outstanding Actor, and Outstanding Actress. Since I finished watching Season 1 of Homeland just last week (don't have Showtime, but I got Netflix! ), I gotta say, it's one hell of a show, and yeah, Daiman Lewis and Claire Danes are heavy hitters, who are doing phenomenal jobs with two very complex roles in Homeland. I really have no problem with them getting the recognition they deserve. As for our boy Bryan Cranston, it's worth remembering that the Walt of Season 4 was a largely passive character, seemingly moving in reaction to other people's actions. I expect to see quite a different outcome at the 65th Emmys, when Cranston's viscous, scene dominating Walt comes under consideration. Of course, there was one notable win for Breaking Bad, as Aaron Paul came in ahead of both Giancarlo Esposito, and Mark Margolis to win his second Emmy for Outstanding Supporting Actor. This one was well deserved. As much respect as I have for Esposito and Margolis' acting chops (and that respect compares to Luca Brasi's for Vito Corleone), Season 4 was Jesse's - and Aaron Paul's - season. Paul continued to bring an astonishing depth to Jesse's character, finding a new hardness, a new acceptance, and fully realizing the bravery which has been lurking in Jesse throughout the series. From the open to "Box Cutter," where, as Gus cuts Victor's throat, Walt recoils, almost puking, but Jesse, leans forward and meets Gus' eye, Paul gave us yet another layer to Jesse. His portrayal of a young man desperate to drown out his own thoughts and memories in drugs, noise, and constant activity was heart-wrenching and very real. His recovery through an unexpected friendship and mentoring by Mike, allowing Jesse to give his loyalty to someone who he could truly respect, was equally well played, as was utter rage at Walt when he believed he'd poisoned Brock. 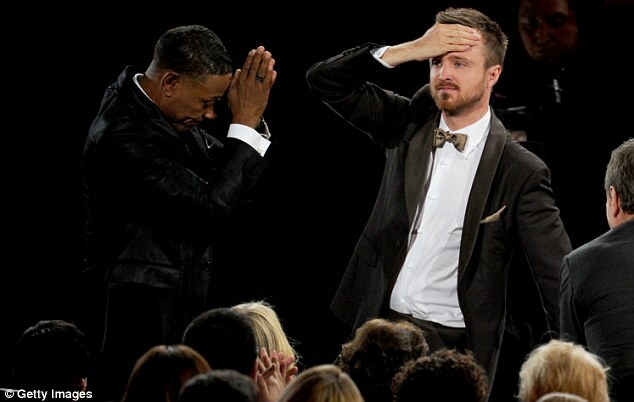 Jesse was the role of a lifetime in Season 4, and Aaron Paul played it to the hilt with true style. Well done indeed. As to giving Homeland the Emmy for Outstanding Drama, I think that was a bad call. Much as I like the show, and I do, it's nowhere near as tight and bright as Breaking Bad, and where 96% of the time I'm able to believe Walt and Jesse and crew, Homeland, Carrie, and Brody only have be about 75% of the time. I expect Season 2 to be better, but I have a feeling that Homeland's shiny newness had more than a little to do with its big win last night. That's it for this week, Readers Mine. As always, be sure not to miss Dale's "Walter White Wednesday" this week, and I'll see you all back here next Monday!